Have you ever wondered what vegetables are grown in North Carolina? We have some of the best vegetable growers in the whole country! Let’s take a look at eight vegetable crops for which North Carolina ranks in the top 10 highest producing states in the country. Cabbage. North Carolina ranks ninth nationally for cabbage production. While California is the top producing state, North Carolina farmers grow almost 70 million pounds of heading cabbage annually. Our top cabbage production takes place in coastal Pasquotank County and in Wilson County in the Piedmont. Squash and Watermelon. North Carolina ranks eighth in the production of both of these crops nationally. Michigan ranks first in squash production and Florida ranks first for watermelon production. North Carolina grows more than 21 million pounds of squash and over 144 million pounds of watermelon annually. If you are looking for those crops in North Carolina, start in Cleveland County for squash and Wayne County for watermelon. Those are the top producing counties in North Carolina for these crops. Cantaloupe and Tomatoes. North Carolina ranks seventh in the country for both crops. While we don’t grow quite as many cantaloupes as Georgia or as many tomatoes as California, neither does anyone else in the country. Wilson County tops the list for cantaloupe production in NC. But to find NC’s top tomato-producing county, you have to go out west to Henderson County. We grow a lot of these crops in the state, with 20 million and 96 million pounds of cantaloupe and tomatoes, respectively. Cucumbers. North Carolina vegetable farmers rank fifth in the nation for cucumber production, growing 149 million pounds of cukes. Sampson County is the state leader in cucumber production. Pumpkins. We’re fourth in the nation for pumpkin production, with almost 94 million pounds. 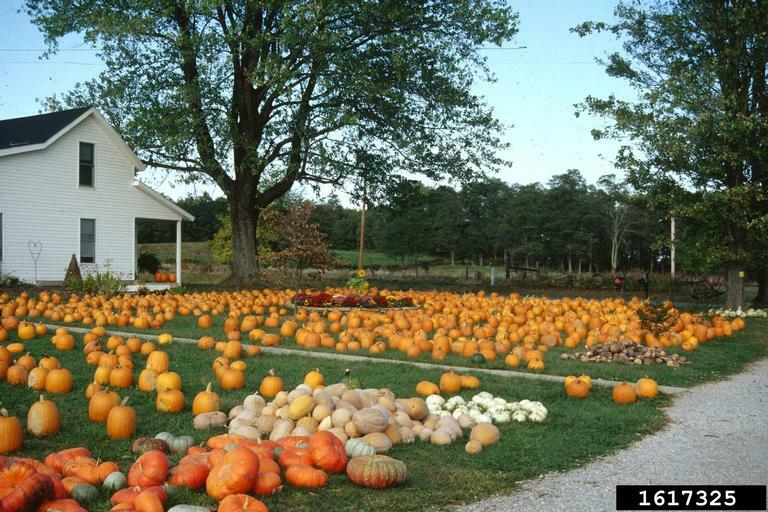 If you are looking for pumpkins in the state, check Allegheny County. Sweet Potatoes. We grow 1.7 billion pounds of sweet potatoes annually. That’s a lot of sweet potatoes – and we grow more of them than any other state. In fact, we grow more than half of all the sweet potatoes in the whole country. If you want to get your hands on some of those roots, head over to Nash, Sampson, Johnston, Wilson, and Edgecombe Counties. They are our top sweet potato producing counties. When you choose sweet potatoes for dinner, you help support our North Carolina vegetable farms. If you would like to know more about what’s grown in North Carolina, check out our agricultural statistics book, published by the North Carolina Department of Agriculture and Consumer Services. The book is published and updated annually and has information about vegetable crops, fruit crops, animal production, and much more. Check it out! • Celebrate the Luck of the Irish!